Brick Fest Live! 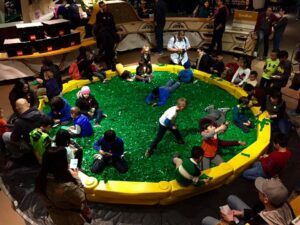 Review by Bernadette Watkins | Kids Will Always Have Fun At Brick Fest Live! Kids Will Always Have Fun At Brick Fest Live! Kids will always have an awesome time at Brick Fest Live featuring LEGO!!! I mean who doesn't love LEGO? Each year Brick Fest has a show dedicated to LEGO fans of any age! This year my family and I attended one local to our home in Richmond, Va on Oct 7- 8th. We had lots of fun and can't wait until next year's event! Each year they pick new and exciting locations where they can feature all there is LEGO to your LEGO Fanatic!!! Here is what you will enjoy each year!!! The Brick Show Experience: Meet popular YouTube LEGO show hosts from The Brick Show and be featured on in an upcoming video. Brick Fest Derby: Build and race your custom built LEGO derby car down one of our 35-foot long timed tracks! Collaborative Building Activities: Contribute to large-scale mystery floor mosaic. Inspiration Stations: Add to existing LEGO cities and make them your own by building custom creations. Video Game Arena: Have a favorite LEGO video game? Come challenge your family or make new friends in the Brick Fest Gaming Arena playing your favorite LEGO title head to head. Brick Fest Theater Trivia & Entertainment: Participate in LEGO trivia all while taking a break from what will be an overwhelming amount of awesome! Mosaics: Using a colorful variety of LEGO bricks, build a piece of art to proudly display for other attendees. Shopping: Find new, vintage, rare, and custom LEGO sets and merchandise from one of the many merchants in attendance. Learn more information about Brick Fest and tickets Click here!